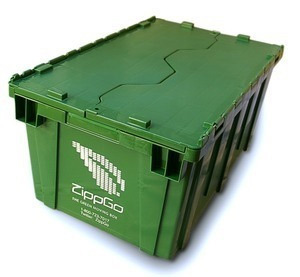 Erin Bradner loves Zippgo moving containers. She described to a group of 150 people at the Lean UX Denver conference how she loved using those durable containers in her last move. Erin is a promoter. She’s personally vouching for, and communicating the value and utility of, someone else’s product. Erin gets no commission or recognition from the company. They didn’t ask her to do it. This positive word-of-mouth has a bigger impact than paid media or any contrived social media campaign. You can’t have promoters without a great product or service. The many delighted customers of Apple products (a.k.a. 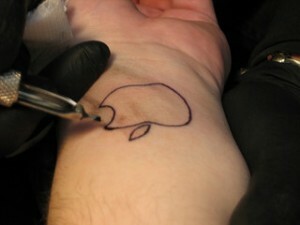 iSheep) are another familiar example of customers who love to talk and blog about anything Apple. Great products with positive word-of-mouth generate sales and growth. This is the idea at the heart of the Net Promoter Score made popular by Bain and Satmetrix. The Net Promoter Score (NPS) puts a number on the value of word-of-mouth by having customers answer the single question, “How likely is it that you’d recommend this product to a friend?” Response options range from 0 (Not at all) to 10 (Extremely likely). Reciheld and Satmetrix found that responses of 9 and 10 are the customers most likely saying something positive about the product to others. They dubbed this group “promoters”. So just how valuable are those promoters? How many customers does a promoter generate? We’ve looked at these questions across hundreds of websites, and dozens of software and hardware products. The answer varies based on the maturity of the product, industry and company. The most accurate approach is to tie actual sales to survey responses to see how many customers who promote actually recommend, and how many of those people who heard the recommendation actually became customers. In our experience, the databases in most companies are so disparate that connecting customer survey data to sales data is too difficult. It’s not that it’s technically difficult, it’s usually because the data and initiatives are owned by different teams (usually marketing and IT) who have different projects. But Owen and Brooks in Answer the Ultimate Question provide one way to estimate the value of a promoter from using survey data alone. The figure below shows how to estimate the value of a promoter for the popular consumer tax preparation software TurboTax. This is data we collected in 2011 as part of our assessment of consumer software products. TurboTax had the highest Net Promoter Score of 56%. By surveying current users of TurboTax, we were able to estimate the number of customers who referred other customers, and then those who reported buying TurboTax via a referral. These two factors, in addition to the “likelihood to recommend” question, allow us to estimate that it takes on average five new promoters to generate enough positive word-of-mouth to net a new customer. Figure 1: The estimated value of a promoter for TurboTax. Here’s a little more detail about each of the boxes in the image above, starting from the upper left. Positively Referred: Ask each customer in a survey if they recall actually referring anyone to consider using the product or website in the past year. People have notoriously inaccurate memories but this can give you a rough idea about a historic referral rate. In this case, it was 61% from our sample of TurboTax customers. Conversion Rate: Ask each customer if a friend or colleague referred him/her to the product. Again, memories are faulty, but this gives you some idea about the percentage of current customers who came to purchase the product, website or service from a referral. For TurboTax, it was 42%. 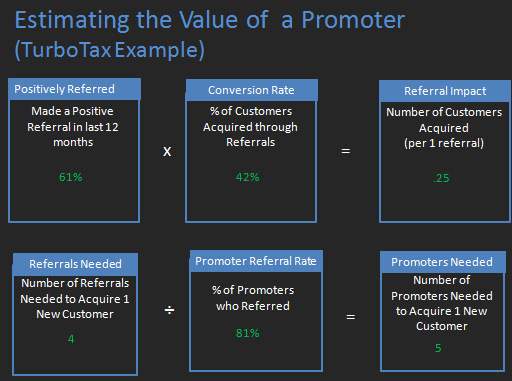 Referral Impact: By multiplying the percentage that made a positive referral by the percent of current customers that were referred, you have an idea about the number of customers you get through each referral: 0.61 x 0.42 = 0.2562 (Note: The slight difference from 25% shown in the slide to 25.62% is due to rounding). Referrals Needed: Because there aren’t quarters of people walking around, it helps to get a whole number of customers you need to generate a referral. Dividing 1 by the referral impact gets you the total number of referrals you need to generate one new customer 1/0.25 = 4. 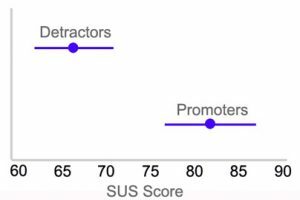 Promoter Referral Rate: One thing we noticed from looking at all our data is that despite the guidance that answers of 9s and 10s are more likely to recommend a website or product, it doesn’t necessarily mean all the respondents actually will recommend. While people’s ability to recall past behavior can be poor, their ability to predict future behavior is even worse. To help account for that uncertainty, we like to look at which promoters said they referred someone else in the last year and use that as a proxy for those who are more likely to refer someone in the future. I also call this the Promoter Efficiency Rate. From the study of 21 consumer software products we performed in 2011 we saw a low percentage (43%) of promoters actually referring PowerPoint, and a high percentage (96%) referring Dropbox. For TurboTax, 81% of the sample of promoters said they referred someone else to the product in the last year. Promoters Needed: By dividing the Referral Impact Rate by the Promoter Referral Rate, you get the number of promoters needed to gain a new customer. This works out to be five new promoters needed to generate one new TurboTax customer. With some estimate of the number of promoters you need to gain a new customer, you can then weigh the cost of new programs, features, pricing and promotions to determine if the benefit of the new customers outweighs the cost. For websites, a new “customer” might just be a new visitor or subscriber so the cost of gaining new promoters can be important. These estimates are based on survey data and, therefore, aren’t as reliable as actual internal numbers. If actual referral rates or conversion rates are available from historical data then those can be used to supplement or supplant the survey data. Keep in mind that past behavior is no guarantee of future success, so having data on the past and potential future is a prudent approach. With any survey data comes a margin of error as we’re almost always dealing with a small fraction of the customer population. 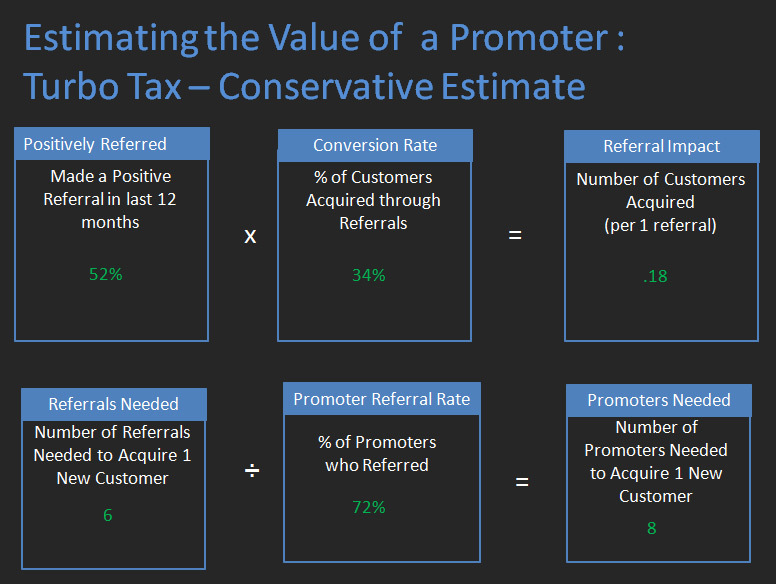 As an added step, I also like to compute a conservative estimate of the value of the promoter. For the boxes labeled “Positively Referred”, “Conversion Rate” and “Promoter Referral Rate”, I also use the lower boundary of the confidence interval. For example, from the sample of 117 TurboTax customers we surveyed, while 61% said they referred someone in the past year, the 90% confidence interval is 52% to 68%. So the more conservative estimate is to use the lower end of 52% instead of the average of 61%. The figure below shows the updated figures using the lower boundary of the 90% confidence intervals. Figure 2: The estimated value of a promoter for TurboTax using the lower boundary of the 90% confidence interval as a more conservative estimate. Finally, one factor we didn’t apply here is estimating the cost of detractors. People will say negative things about a product or website that can have an even bigger impact than positive word-of-mouth. We’ll cover the cost of detractors in a future blog.